I volunteer for the kids, the other volunteers, the love of bicycling, and because being at the Holiday Bike Drive feels right and good. 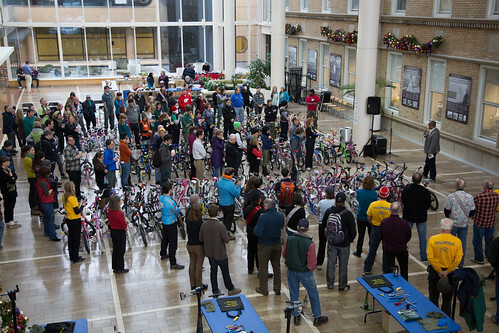 Every year, the Community Cycling Center brings the gift of bicycling to approximately 375 children. This annual event requires the work of over 500 volunteers, and I’m one of them. During the morning shift, I see about 225 volunteers, 190 children, and about 250 trusted adults – all of whom seem to be having a pretty good time. No matter where I am at the Holiday Bike Drive, there are always lots of volunteers, lots of kids and their adults, and people doing at-the-hospital things. 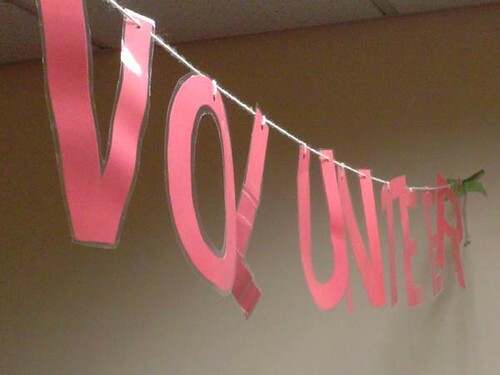 My Holiday Bike Drive volunteer shifts have been in hallways. I like hallways. They provide lots of opportunities to people watch. My first year at volunteer registration I watched mostly the volunteers. My second and third years I watched mostly the kids and their trusted adults. The volunteers who speak languages in addition to English always impress me. This year, I know we had Spanish, Vietnamese, and Somali speakers come through the Bike Safety Education hallway with interpreters. I know that many of the people I saw speak other languages, too. I use gestures and words. We all speak in smiles. “We provide bicycles to children who would otherwise not have access to one. We teach them how to be safe and give them a chance to practice what they learn,” I say. “That’s so wonderful,” she says and goes on her way with a big smile. 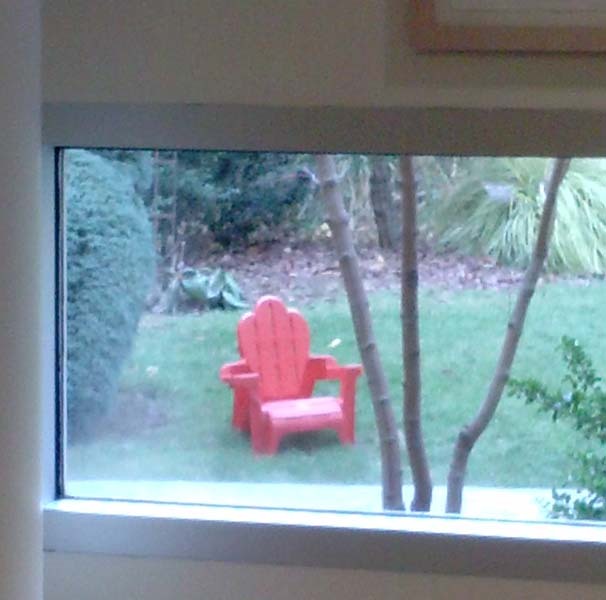 A girl in the Bike Safety Education hallway wows at something outside the window – effectively drawing my attention to the red, kid-sized, Adirondack chair in the courtyard, standing out against the green grass backdrop. I wow to myself, take some pictures of the chair when the hallways clears for a moment, but the pictures don’t capture the heart of the moment when the girl wowed. Another girl, littler, wearing a sweater dress belted delicately at her waist, black hair pulled back in fancy barrettes, a tubular silver handbag hanging from her forearm, beams quietly for her first bike. I don’t even have my camera out, but I look forward to seeing her again. For me, it’s the sum of these things I see and experience in the hallways that makes the Holiday Bike Drive the incredible event it is. I know it wouldn’t happen without the help of all the volunteers, sponsors, donors, partners, and others who contribute time, energy, space, resources, and, yes, bikes. A huge thank you to all for making it possible! You can be sure I’ll be there again next year. It’s easy to volunteer for the Holiday Bike Drive. And if you can’t wait a year, there are many other equally exciting volunteer opportunities with the Community Cycling Center during every season. Get in touch with Randi Orth, Community Cycling Center’s Volunteer & Outreach Manager, or visit the Community Cycling Center’s Volunteer Opportunities page to find out how you, too, can get involved.